Food as homage has a deep tradition and the Italians, while not on the level of the French when it comes to naming every sauce, condiment or even vegetable cut after someone, are certainly not going to shy away from honoring Queen Margherita with a pizza or or restaurateur Alfredo di Lelio with a certain Fettucine dish. One of the oddest stories involves a lesser noodle, Mafaldine (little Mafaldas), Mafalda, Mafalde or Reginette (little queens), (Of course, it has many names as so many things Italian do.) and the second daughter of King Emmanuel II, Princess Mafalda of Savoy (the Italian Alpine region bordering France). In 1902, pastamakers created a pasta for her birth, although it’s likely that they simply renamed ‘manfredine’. With so many shapes, perhaps there were some pasta makers that didn’t know it already existed. 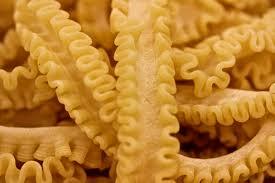 The pasta is a broad ruffled flat noodle made from semolina and water and extruded. It is fun to look at and even more fun to slurp. At L’Oca d’Oro, we leave ours particularly long to defy pasta gravity. We have dressed them numerous ways throughout the year as they are common in Puglia and Sicily and are therefore suited to alot of Central Texas Summer ingredients. But, in winter and with a Northern Italian focus, we are dressing them in a way that perhaps Mafalda would have seen. Pine nut butter, golden raisins and pickled fennel. It is a simple, creamy vegan dish with sweet and sour complexity. But, no dish can capture the tragic complexity of the rest of Mafalda’s story. Having a noodle named after her birth may have been the highlight of her short life. At 23, she married Prince Phillip of Germany, a Nazi, who became an emissary between Berlin and the Fascists in Rome. (It’s satifying to be able to write the word nazi and fascist and not be afraid that some Internetter is going to tell me that I’m going to far. They really were Nazis and Fascists.) Hitler and Goebbels, however, did not like the Princess. In 1943, when Italy surrendered, the Nazis put Phillip under house arrest in Bavaria. 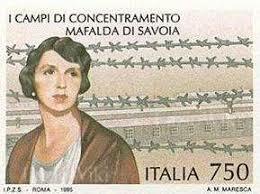 Mafalda’s children were being protected at the Vatican while she was arrested by the Gestapo in Bulgaria and ultimately transferred to Buchenwald concentration camp. She died there after a botched surgery following her injuries during an Allied bombing raid. Her father abdicated the throne to her brother Umberto in 1946 in an effort to save the Italian monarchy but it did not. The Italian Republic replaced the monarchy and Umberto lived out his life in exile in Portugal, alive but without a pasta named after him. That honor was reserved for his big sister, a victim of a horrible time. But, it’s a really fun noodle and she also got a stamp.